Sweet jazzy funk -- from the cornbelt of Omaha! 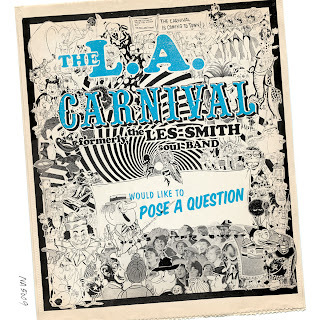 The LA Carnival are one of those rarer-than-rare funk groups who not only never got their due back in the day -- but also recorded a heck of a lot of great material that never even got issued! They have a totally great sound that bubbles in jazzy licks on trumpet, sax, and organ -- next to tighter, funkier vamping on the rhythms -- all of which makes for a killer approach to the groove that's surprisingly fresh, given the passage of three decades since the group's heyday. And leave it to the folks at Stones Throw -- who know how to dig beyond the crates, into the earth, and come up with a lost slice of funk history that has made the world a much better musical place. They've lovingly remastered these great recordings from the early 70s, and have packaged the whole thing with a well-done set of notes that really goes into detail about this unique group, their amazing sound, and their obscure Nebraska origins! An instant funk essential -- and one you'll be thanking yourself for buying for years to come. Titles include "Black Man's March", "Ron's Tune", "The Klan", "Color", "Flyin", "We Need Peace & Love", and "Blind Man". Just picking my way through your archives and finding an outrageous gem about every day. Thanks a ton for all of the great music!! !